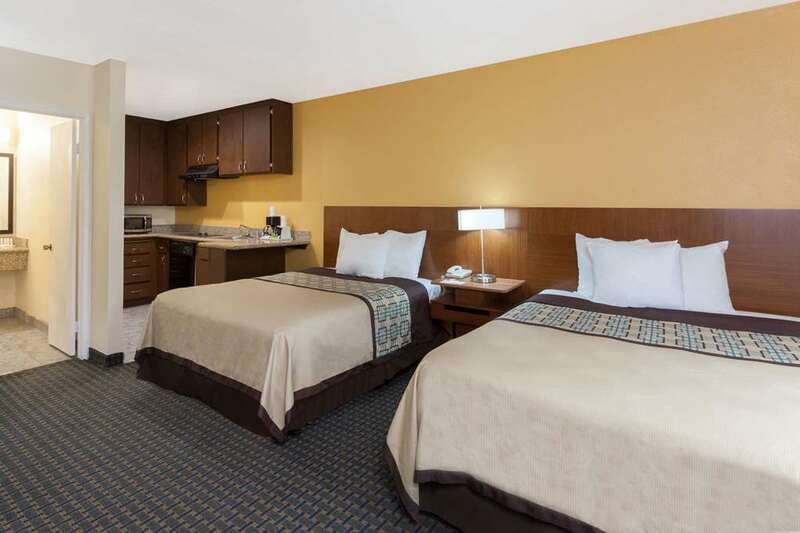 Days Inn and Suites Mission Valley, California is located just 1.5 miles from Qualcomm Stadium and San Diego State University SDSU.At the Days Inn and Suites experience the comfort and central location to Qualcomm Stadium home of the San Diego Chargers. Enjoy a comfortable suite with a Kitchen, Full size refrigerator, microwave, stove and dishwasher. Our property features a complimentary continental breakfast daily, outdoor swimming pool, spa and sundeck. For your convenience enjoy our complimentary wireless high speed internet, free parking and guest laundry. Days Inn and Suites Mission Valley/SDSU is less than 6 miles from two world class shopping centers with over 160 shops, theaters, and restaurants. You will be conveniently located less than 10 minutes from Sea World, San Diego Zoo, Balboa Park, Old Town, San Diego Harbor, Mission Bay, Gas Lamp Quarter, San Diego International Airport, and the San Diego Convention Center and Town & Country Convention Center.